Adam Hahn & Professor Pete Coffey is Director of the London Project to Cure Blindness, Institute of Ophthalmology. 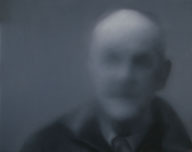 Adam Hahn & Professor Pete Coffey is Director of the London Project to Cure Blindness, Institute of Ophthalmology, will talk about Hahn’s paintings that documents and explores what is seen by people with Macular Degeneration, an eye condition affecting the centre of the vision. Created from the perspective of a person with this condition, these paintings engage the viewer in trying to understand how other people see. In association with the London Arts and Health Forum.